"It’s a mass of un-interpretability to me…All the issues with the trial are extremely worrying, making interpretation of the clinical significance of the findings more or less impossible." CFS is a disease characterised by a collection of symptoms including physical and mental fatigue, muscular/neurological pain and cognitive dysfunction; these symptoms can be exacerbated by exertion. It varies in severity and a minority of CFS patients are severely affected and bed-bound. It is estimated that 250,000 people in Britain are currently affected by this debilitating chronic illness. The PACE medical trial compared four therapies to determine their effectiveness in treating CFS, which is also known as myalgic encephalomyelitis (ME) and is commonly referred to in the UK as ME/CFS. The randomised trial included 641 people with mild to moderate CFS, those with severe CFS were excluded. The therapies under investigation were adaptive pacing therapy (APT) similar to an informal pacing strategy commonly used in CFS, cognitive behavioural therapy (CBT), graded exercise therapy (GET) and specialist medical care (SMC), which consisted of the standard NHS treatment for CFS. There are two competing, and fiercely debated, theories for the causes of CFS. One theory favoured by patients and a number of prominent scientists, with much evidence to support it, is that the illness is caused by a pathological disease process, sometimes described as a physical or biomedical cause. The other theory prominent with British mental health experts, and the authors of the PACE trial is that the illness is primarily due to psychological issues. This theory contends many of the symptoms of CFS are due to physical deconditioning caused by lack of exercise and could be cured if aberrant thought processes were changed. The authors of the PACE trial are proponents of the psychological theory, and the medical trial was designed in light of this. The initial successful results of PACE added weight to that theory and the many years of previous work some of the authors had put into supporting it. But the results of the trial also suited the aims of the Department for Work and Pensions (DWP), who part funded the trial, and the medical insurance industry which have connections to the PACE trial via the researchers. Four of them declared working for the insurance industry in a conflicts of interest statement: Professors Peter White, Trudie Chalder and Michael Sharpe and physiotherapist Jessica Bavington. The DWP is particularly keen on psychological explanations, a.k.a the bio-psychosocial (BPS) model for chronic ill health. Professor Tom Shakespeare says, in the Disability News Service, BPS “played a key role” in the narrowing of eligibility criteria for disability benefits such as Employment and Support Allowance (ESA). Shakespeare goes on to say BPS is used to “underpin increasingly harsh and at times punitive measures targeted at disabled people”, in an attempt by the government to cut the number of people receiving ESA. One of the medical insurance companies White had previously done work for is called Unum Provident Insurance (UPI). They are also proponents of the BPS model of ill health as it helps them to deny disability claims. In 2003 UPI were fined $31.7 million in California for running ‘disability denial factories. In 2005 they were fined $15 million and the California Department of Insurance Commissioner said that “Unum Provident is an outlaw company. It is a company that has operated in an illegal fashion for years…”. UPI is one of the UK’s biggest providers of income protection insurance (IPI) . As a consequence of more holes appearing in the social security safety net, more people are likely to take out IPI, increasing UPI’s profits. The results of the £5 million PACE trial were published in The Lancet in 2011. The paper stated that around 60% of the patients treated with CBT or GET gained improvements in fatigue and physical activity levels, while improvements for APT and SMC were minimal. There was extensive criticism of the published paper at this time, including : conflicts of interest, how trial participants were recruited and how the data was analysed and presented. There is widespread concern in the patient community about the way in which these research results relating to CBT and GET are being distorted in the media and adopted by organisations such as the National Institute for Clinical Excellence (NICE) as a ‘one size fits all’ approach to management. To conclude that they are safe and effective for everyone with mild or moderate ME/CFS, as NICE currently does, is simply wrong. NICE did indeed adopt GET and CBT as therapies to treat CFS, even before the PACE trial had finished. As a result it has become the standard NHS treatment for CFS and is still recommended as such. The press lapped up the stories emerging from the PACE trial. The Daily Mail declared in 2011 ‘Fatigued patients who go out and exercise have best hope of recovery, finds study”. The BMJs report on the trial said some PACE participants had been “cured”, before any claims for their recovery had been made by the PACE trial. Another Daily Mail headline in 2013 read “Chronic fatigue victims ‘suffer fear of exercise’: Patients are anxious activities such as walking could aggravate the condition”. There were many more headlines like these, providing false hope and further stigmatising those with ME/CFS by implying that it is within their power to recover if only they would try a little harder. The anonymised PACE trial data released to Aleem Mathees, of Perth, Australia, has undergone a preliminary analysis using the trial methods published in the original protocol. They are compared to the results published by the PACE trial researchers using a substantially altered version of the protocol, changed mid trial, that has been the subject of widespread criticism due to being poorly justified and overly lax. This initial publication of the preliminary analysis is not peer-reviewed. However, the data analysis has been carried out by the authors which include two expert statisticians, Professor Philip Stark from the University of California and Professor Bruce Levin from Columbia University. 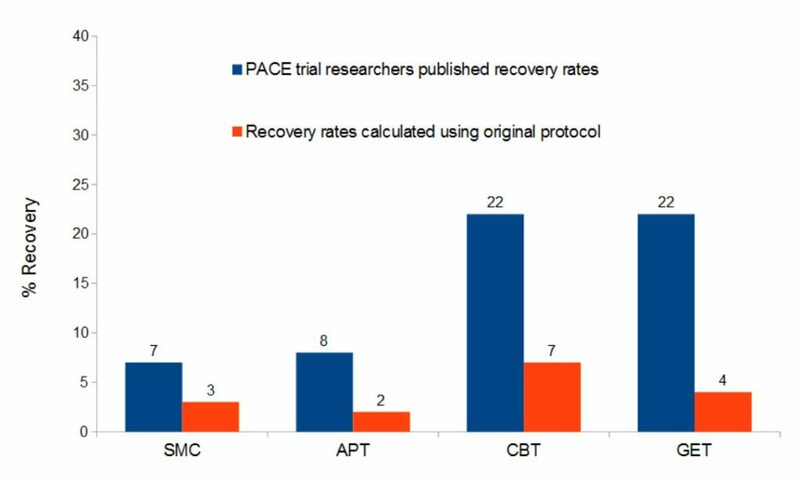 As can be seen in the graph below the mid-trial changes to the PACE protocol inflated the results.And, there were no significant differences between the groups, which contradicts the claims of the PACE trial results which showed that GET and CBT were significantly more likely to be associated with recovery when compared to SMC. The recovery scores calculated in Mathees publicatione were: CBT 7%, GET 4%, APT 2% and SMC 3%. Pending a comprehensive review or audit of trial data, it seems prudent that the published trial results should be treated as potentially unsound, as well as the medical texts, review articles and public policies based on those results. The FOI request was made in March 2014 following several previous unsuccessful FOI requests which had asked for an analysis of the data according to the outcome measures of the original trial protocol be released. This would enable comparison to the published PACE data set which had been analysed with altered outcome measures in a revised protocol. QMUL denied these previous requests citing the costs of recalculating the data were too expensive. To prevent a similar refusal, Mathees asked for the anonymised original data set so he could arrange the data analysis himself. This time, QMUL refused on the grounds that the data could not be sufficiently anonymised to protect the identity of the trial participants. During these FOI requests, QMUL and the PACE researchers adopted a policy of demonising those ME/CFS patients who criticised the PACE trial by portraying them as unreasonable, obsessive and unstable. They hoped that these arguments would convince the authorities not to release information to such dangerous malcontents. Professor Anderson’s ‘wild speculations’ about the possibility of ‘young men, borderline sociopathic or psychopathic’ attaching themselves to the PACE trial criticism ‘do him no credit’. Nor do his extrapolations from benign Twitter requests for information to an ‘organised campaign’ from an ‘adversarial group’ show that he has maintained the necessary objectivity and accuracy that he is required to maintain. It was clear that [Anderson’s] assessment of activist behaviour was, in our view, grossly exaggerated and the only actual evidence was that an individual at a seminar had heckled Professor Chalder. Changes to the methods protocol half way through the study. Which meant a more favourable outcome was likely to be observed for the therapies being tested. Changes to the methods protocol left an unusual artefact. Thirteen percent of the study participants although disabled enough to get on the trial, were also scored as recovered before any treatment took place; once the revised methods were in place. A newsletter was released to PACE participants part way through the study singing the praises of CBT and GET. It including positive testimonials from people on the trial (which didn’t indicate which treatment) saying how much the treatment had helped them. Claims of successful treatment and recovery were based on how the patients said they felt. Measured outcomes such as – a step test, a walking test, data on finance and employment – failed to support claims of successful treatment. Unsuitable use of statistical methods. The three co-principal investigators of PACE , Professors Peter White, Trudie Chalder and Michael Sharpe, all refuted these allegations in a reply to Tuller’s report. Professor Ron Davis, of Stanford University, is director of the Science Advisory Board overseeing the End ME/CFS Project. He is a leading researcher into the biomedical causes of ME/CFS, and appeared at an international Invest in ME conference in London this year. I’m shocked that the Lancet published it…The PACE study has so many flaws and there are so many questions you’d want to ask about it that I don’t understand how it got through any kind of peer review. The study needs to be retracted… I would like to use it as a teaching tool, to have medical students read it and ask them, ‘How many things can you find wrong with this study’? Due to the PACE trial, GET and CBT are the recommended treatments for ME/CFS not just in the UK but around the world. But, the tide may be turning. The US Agency for Healthcare Research and Quality (AHRQ) has downgraded its conclusions on the effectiveness of CBT and GET, due to a re-analysis of the PACE trial and others, instigated by David Tuller’s report. The AHRQ now concludes that GET is ineffective for ME/CFS patients, and that CBT is barely effective. Aleem Mathees is carrying out a more detailed and complete analysis, which will hopefully be published in a peer-reviewed journal. When this happens the calls for the retraction of the published PACE results will gain traction, and the extent to which the PACE researchers may have held back progress in ME/CFS research and treatment will become apparent. What also needs to be seriously considered is how the conflicting interests (the DWP and the insurance industry) present in the PACE trial may have influenced the results to come out in their favour. It is troubling cases like the PACE trial controversy that highlights the importance of transparency in clinical trial data so that the results can be verified by other scientists. The PACE trial researchers repeated refusals to release the data discredits them and their science. Maybe now with the results of the PACE trial being ‘potentially unsound’ more progress can be made in biomedical research into the causes of ME/CFS. Possibly leading to affective treatments for ME/CFS being developed, and decreasing the burden to individuals and society of this debilitating and misery inducing disease.